Stand out from the crowd with brilliant yellow twin loop wires! Even the smallest attention to detail can make you outshine the competition. And bright colors, definitely including yellow, bring brightness to even the mundane projects. And we carry our own brand of twin loop wires, available in 3:1 pitch. The sheet capacity of 20lb text paper ranges from 40 to 110 sheets. And we have them at standard lengths; just make your binding process a little easier. 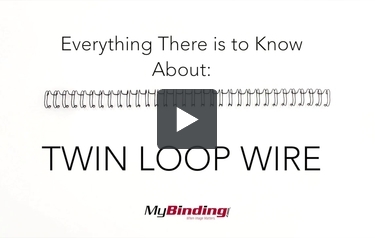 Binding your presentation, manuals, projects, or other hard work in twin loop wire will yield impressive results.